Major Benjamin Tallmadge was placed in charge of the Culper Ring by George Washington, in 1778. Tallmadge, code name John Bolton, recruited antebellum friends and neighbors to become members of the spy ring. Tasked with gathering and relaying information in New York to George Washington, Tallmadge set up a complex system with the other members. Tallmadge was tasked with transferring the information to Washington (2). After his service in the Revolutionary War, Tallmadge ran for and held a seat for Connecticut in the United States House of Representatives for eight terms (3). Austin Roe was a key member in the Culper Spy Ring. Childhood friend of Benjamin Tallmadge, Austin Roe became a member of the close-knit, secret ring (5). Roe played the key role of a courier in the gathering/passing of information. Roe was a tavern owner, which gave him the perfect alibi to travel to New York City for "goods." While in New York, Roe would collect information gathered by Abraham Woodhull and carry it back to Setauket where he replayed the information to Caleb Brewster. Roe risked his live everyday by traveling long distances through British territory with sensitive information. Anna Strong was one of the few woman American Revolutionary spies. Benjamin Tallmadge recruited Strong because of her house and because she was his step mother's sister (7). Strong lived in a house that "commanded a panoramic view of nearby Setauket Harbor. (8)" This view allowed Strong to be able to alert Abraham Woodhull when Caleb Brewster had crossed sound . Strong was tasked with hanging clothes on her clothesline that represented different messages about Brewster. Abraham Woodhull was considered to be Tallmadge's primary agent. Woodhull, a farm owner, was in charge of gathering information to be relayed back to George Washington. Woodhull would visit his sister, Mary Woodhull, in New York City where he would gather information about British ships, goods, and movement. This gave Woodhull a high position in the ring because of his important role and decisions of what information is important and what information is not. Woodhull operated under the alias Samuel Culper, Junior (9). Robert Townsend played a very important role in the Culper Spy Ring. Townsend took the identity of a British Loyalist in New York City while he spied (11). To secure his identity, Townsend also wrote for a Loyalist Newspaper (12). Townsend was a tavern owner and used the excuse of buying goods to visit New York City. Since Townsend was perceived as a Loyalist he was trusted by many, including British military personnel (13). This trust aloud others to share sensitive information with him, which he replayed back to Austin Roe. Caleb Brewster was the only identified spy by the British of the Culper Ring (14). 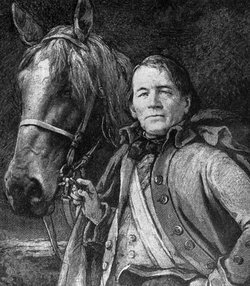 Childhood friend of Benjamin Tallmadge, Brewster joined the ring (15). Brewster was an experienced with whale boats and his tasks often involved him on the Long Island Sound. One of Brewster's task was "commanding a fleet of whaleboats against British and Tory shipping on Long Island Sound" (16). Brewster was also in charge was carrying information from Abraham Woodhull across the sound to Benjamin Tallmadge. 1. Ezra Ames. Portrait of Benjamin Tallmadge. 1800. 2. "The Culper Ring." 96-99. 3. Charles Scribner's Sons, "Benjamin Tallmadge," In Dictionary of American Biography. (Accessed April 28, 2016) http://ic.galegroup.com/. 5. A&E Television Network, LCC, "The Culper Spy Ring," History Channel (Accessed February 8, 2016) http://www.history.com/. 7. "The Culper Ring." In The Revolutionary Era, 1754-1783, 96-99. 9. "The Culper Ring." In The Revolutionary Era, 1754-1783, 96-99. 11. Mount Vernon Ladies’ Association, "American Spies of the Revolution," George Washington's Mount Vernon (Accessed April 26, 2016) http://www.mountvernon.org/. 14. A&E Television Network, LCC, "The Culper Spy Ring."